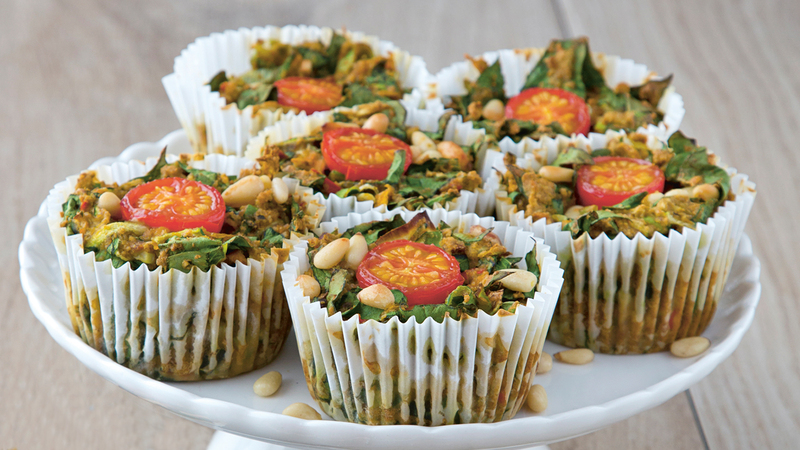 Impress you vegetarian guests with The Happy Pear's Easy Veg Sformata with Sun-dried Tomato Pesto and Pine Nuts. The perfect dish for a starter or canapé. 1. Preheat the oven to 180°C/gas mark 4. Line eight holes in a 12-hole mu­ffin tray with paper cases. 2. Put the spinach, carrot, courgette, spring onions and chilli in a large bowl and stir to combine. Set aside. 3. Sift the ‑ our and baking powder into a separate large bowl and mix together. Add the stock and mix together until it forms a smooth batter. Add the pesto and pine nuts and incorporate until it is well combined. Add the veg to the batter and mix it all together. 4. Divide the mix between the eight paper cases in the muffin tray. Flatten and smooth the tops of each mu­ffin. Put a halved cherry tomato in the centre of each mu­ffin, cut side up. 5. Bake in the oven for 15 to 20 minutes, until the tops start to turn golden and they are fully cooked through. Serve hot or cold. Sformata is a fancy Italian word for a light savoury flan. Tasty, really easy to make and great as party food with a sweet beet hummus or for dinner with some roast veg and a green salad. It even works well in lunchboxes.